12 students from JA Slovakia, included one ESP holder, have been invited to the Presidential Palace in Bratislava. 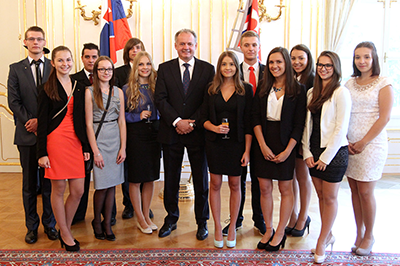 Best JA students and their teachers had the opportunity to meet and talk to the President of the Slovak Republic, Andrej Kiska, about their practical entrepreuneurial experiences. “I´m very happy that I decided to take part in the ESP project. Together with Company Programme experience it gave me a big start point for my next steps. I fully realize that not everyone can meet with the President, that´s why I highly appreciate the further opportunities I can access thanks to the ESP“ said Juraj Šimko, student of the Company programme who gained the ESP certificate last school year. "I keep saying that the future depends on the level of education of our country. One of the things that we lack is a better connection between schools and the practice. That´s why I am really glad that there are activities such as the Company Programme, where students have the opportunity to try out the real world of business," said the President. Before the appointment with the President, all the students enjoyed a business lunch, hosted by the CEO and Chairman of the Board of Directors of JA Slovakia.